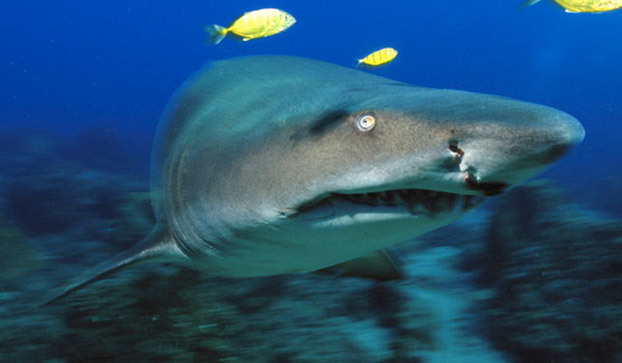 Overview — Shallow waters are the sand tiger shark's preferred domains, but they will often dive to 656 feet in their range, which includes the Pacific Ocean, Indian Ocean, eastern and western Atlantic Ocean, and Mediterranean and Adriatic seas. The battle waged inside a mother during her gestation tells another story. Because embryos develop at different stages, the resulting offspring compete with each other before the mother gives birth. The largest, with teeth already developed, ends up consuming all of the other eggs and embryos. Exemplifying survival of the fittest, this larger embryo then develops to become the mother's sole offspring. Feeding Habits — Groups of these sharks have been spotted surrounding schools of bluefish and attacking nets full of them. Other fish in the shark's diet include menhaden, cunners, mackerel, skates, silver hake, flounders, alewives, butterfish, scup, weakfish and bonito. Virtually all hunting occurs at night.